Carl Ballestero was my Hero, my Pastor, my Best Friend and my Dad all rolled up in one. He died on 9/11/1994. That was my 9/11. Of all men, I am most honored, to have been his son. I am proud of the Heritage he has given to me and I am blessed with wonderful memories. I miss him daily. Every time I get up to preach, I always quote something that my He use to say. The crowd may not know it, but I do. My Father’s wishes were that his sermons were to be given away, and not sold. 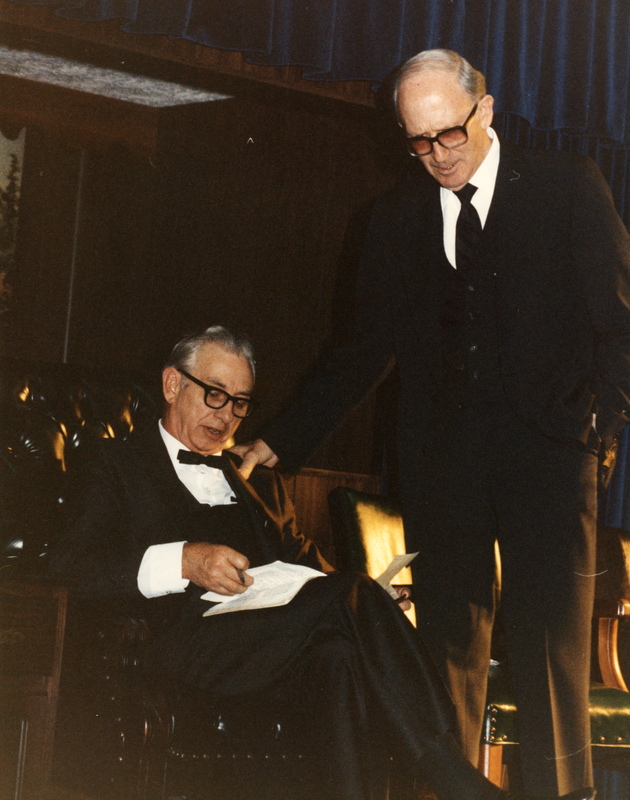 I would love to find more of Dad’s sermons. If you know of any and would leave me a link or a website address, I would be thrilled. Post a message at the bottom of the page. Thank You! I will be happy to upload more sermons and sermon notes, as soon as possible. Woman, What Is This That Thou Hast Done? 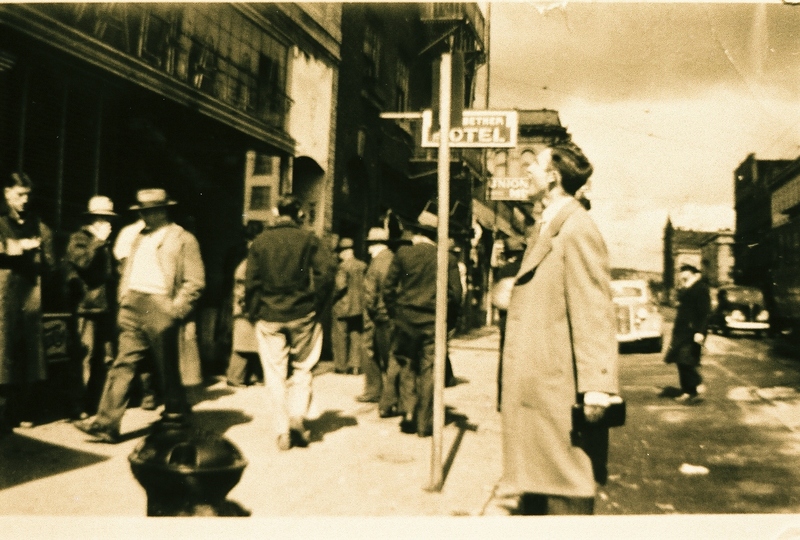 The 1st photo is Dad preaching on a Fresno, CA skid-row in the late 1940’s. I marvel that no one is listening to him. Sadly that is becoming more and more common in too many churches. Dad preaching in Shelbyville, IN 1984. Afternoon Bible Class in Shelbyville, IN. Dad and one of his dearest friends, Robert C. Cavaness. 19 years old. He’s only had the Holy Ghost one week. 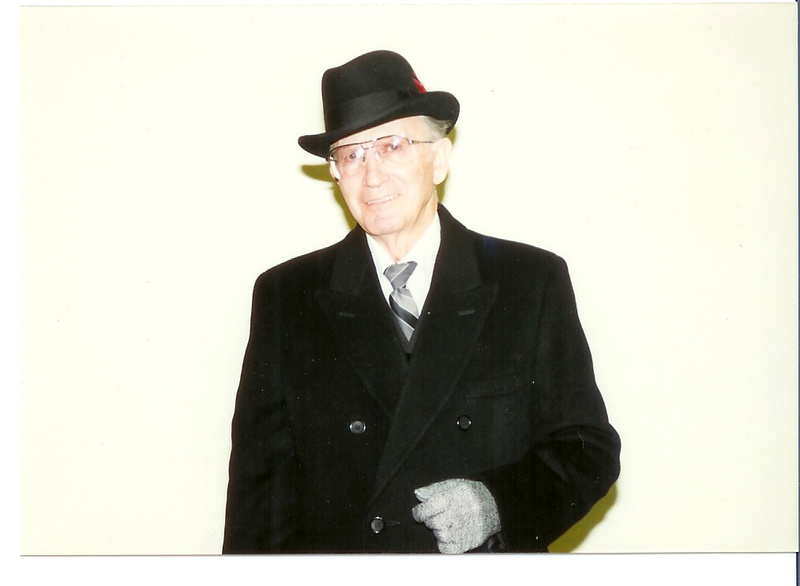 Dad, wearing his signature Homburg hat. In 1988, knowing my father was in his 1st year of Alzheimer’s, I tried to capture every moment I could. It’s in my heart, it’s in my heart. You are more like him than you will ever know. Not only do you look like him, but you use words like he did & paint a picture every time. I always said Daddy preached like Norman Rockwell painted…..using a picture & making it so plain to understand…..& oh so beautiful. I miss him so much but you always keep him alive. Thanks!! That First Picture, is one of Brandon and I’s favorites..I cry everytime I look at it seems…Loved my Grandpa!! I agree, you are so very much like your (our father)! Not just in style of preaching but in love and kindness! I feelin the need to see ya, let me know when we can get together! Loved the picts of the Elder! All I can say about the Elder Ballestero is Precious, Precious, Precious! I’ll never forget his message years ago in Central City, “I Love My Master”. My husband and I loved this man dearly. Thank you for this priceless treasure. Such a great example of a Man of God that I could only hope to pattern myself after. Wish I had more memories of these mighty men of God. I never had the blessing of meeting Elder Carl Ballestero, but I have heard so much about him from my pastor and father-in-law, Elder Michael L. Phillips. He speaks of him often and uses sayings that he attributes to him. While my pastor’s ministry is definitely his own, it has Elder Ballestero’s fingerprints all over it. He was precious to Brother Phillips! I wish I could have had the honor of meeting him myself. He seems to have been such a sweet-spirited and humble man. My wife (Angela) and sister-in-law (Michelle) looked at him as a grandfather. I have definitely been blessed many times by the ministry of Elder Martyn Ballestero. He is one of my favorites (if it’s legal to have favorites!). I just found the blog…I will be returning often! Elder i have greatly enjoyed this site. My family learned to love Bro. Carl and Sis Content Ballestero in church in Ssnta Ana,CA. Bro Harvey and Sis. Jackie Davis loved them so. “It’s In My Heart” — I just happen to be on a fishing expedition here of trying to find out who composed that one — lyrics and music — and wondered if you still have that sheet music around someplace that I see your dad holding as he sings, and your mom (is that your mom?) reading in front of her as she plays. I don’t need to see it, just want to know who wrote it!! Thanks for your ministry, blessings to you!! Bro. Ballestero, I first saw your father’s name mentioned in a biography about Bro. I. H. Terry. I then listened to a message you preached a while back at Bro. Booker’s. I then later had an opportunity to listen to his message ‘Handwriting on the Wall.’ It shocked me, for I was raised around strong holiness preaching, and thought that it did not get hotter than that. I was wrong. His message shook me, and I realised that I had not heard it as hot as it was in the ‘old days’. I really love the old paths, and I hope that everyone will one day discover that they are as good to day as they were then. God bless you and thank you. I only had one opportunity to meet and know Carl Ballestero. It was in Lake Charles, LA. That day I not only met a hero of faith, but a true Christian gentleman. May God bless his memory for generations to come. 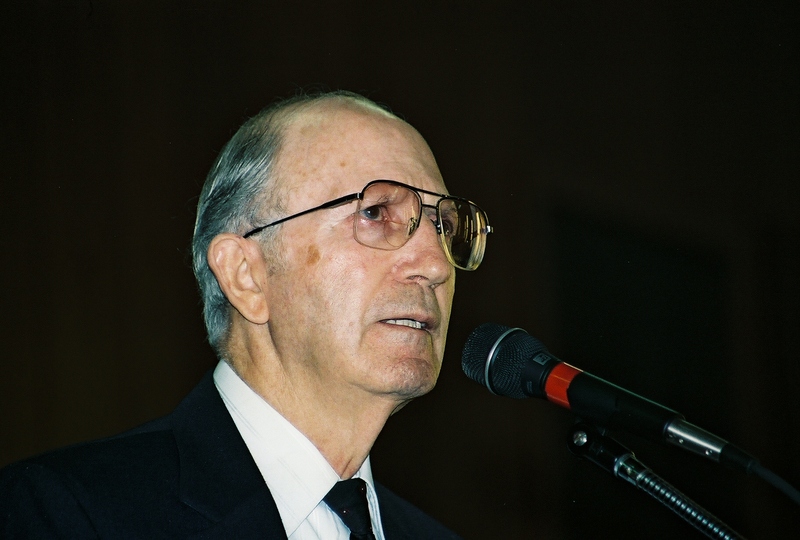 Bishop Ballestero was an Annointed & Powerful Man of God , a Preacher of God’ s Righteousness & Truth. A Holy Man of God, a,lover of God & His Word. In 1979 not to long after I had received the Holy Ghost , I attended my first Revival Service @ Pine La where Elder Carl Ballestero was preaching for Bro. Cox. He preached conviction that night , I had long sideburns & I grabbed my sideburns with both my hands & said to Bro. Steve Zorich , we’re not suppose to have long sideburns. Elder Ballestero preached conviction Messages of God. We love the Ballestero Family. Praise the Lord Brother Ballestero:-) My name is Barbara Meredith and I attend ..Inlandlight House Church in Rialto,ca…I was surfing the internet for some literture and found and Apostolic Archives? You more then likely have been there but seen..The Who’s WHo in the Apostolic World and i did come across your Dads’s Sermons…?..you must be aware of this?? Heard “Handwriting On The Wall” when I was 24, I’m now 36. How prophetic was that message. Sadly, much he spoke has come to pass. I pray his kind never die out! Just found a tape of Elder Carl Ballestero preaching GOD LOOKED FOR A MAN and I don’t see that on the list of sermons you have posted …. It was from a Mid Winter Conf in Las Vegas, Nv. in 1987. Wow! Thank you for your post! That is one I don’t think I’ve heard! Hello Elder Ballestero. I received a tape from Joyce Peters and would like to upload the mp3 along with my own collection to the website. I have the FTP & link if you would like. God bless. I would love that! thank you and her so very much! Hi! I have a large tape ministry project in Fresno. Is there anyway you could send me that tape “God Looked for a Man” I would convert the tape to mp3, and send it Martyn Ballestero so he can post it here online for the world. I will also return your tape plus a Audio CD version of the cassette also. wetwerd@gmail.com. I will pay all shipping. This library and history is priceless. Im kinda slow elder…but since I have come across this page, and see that you have taken time to share such a rich and profound legacy with your readers, I am going to take the time to listen to each message and take note. I am confident that when im through, I will be a better person for it. Thank you so much…it will be a great honor to make this journey. Thank you so much for making these messages available. I was born and raised in Bro. I.H. Terry’s Church and remember when your Father would come by and preach. He left a great impression on me as a young man, and inspired me to live for God. I have looked long and hard to find some of these messages on recording and today you blessed me. I will now be privileged to have the opportunity to listen to these precious Old Path Messages. Thank you also for your blog and for taking the time to post such great content. Brother Ballestero, I am a new convert and have absolutely enjoyed your father’s sermons. I was wondering if you might shed some light on the celebration of Christmas from your point of view. In my home church, they don’t celebrate “Christmas.” But, in other apostolic churches, they do. Also, what was your father’s take on the Christmas holiday, especially back in the 60’s, before the commercialism really took off? Any information, or advice for a new convert who has celebrated Christmas for 35 years, you can offer would be greatly appreciated. Thank you again! I am glad you have enjoyed my father’s ministry. I am sure his advice to you is to stick only to your pastor’s teaching. He is the one that answers to God for you at the Judgment. Getting second opinions is much like wearing two watches and not being sure what time it really is. Just listened to “Seeing Jesus through the eyes of the enemy”. I was there when he preached that message. i never forgot it. Awesome preacher. I miss our elders so much. Thanks for making these available mt friend! More than 3 Generations, just awesome….and example of Holiness, perseverance and being in fire for God…..God Bless!!! The last time you were with us in Rialto, Ca. your preaching was a beautiful blend of Carl and Martin Ballestero, Thank you Jesus… He was my friend and I miss him so! I heard your dad on holy ghost radio. He preached about a third grade English teacher, and how he was taught to dissect sentences. he was chosen to come to the front of the class and he chose Matt 28:19. Do you have a copy of that message? That was not my father. He was Catholic and never got baptized in Jesus Name until he was in he was 23. The diagraming Matt 28:19 and the English teacher was me. It wasn’t the 3rd grade. It was the 12th. I loved your dad’s preaching and his gentle and quiet nature…he was a true christian. True heros of the faith! 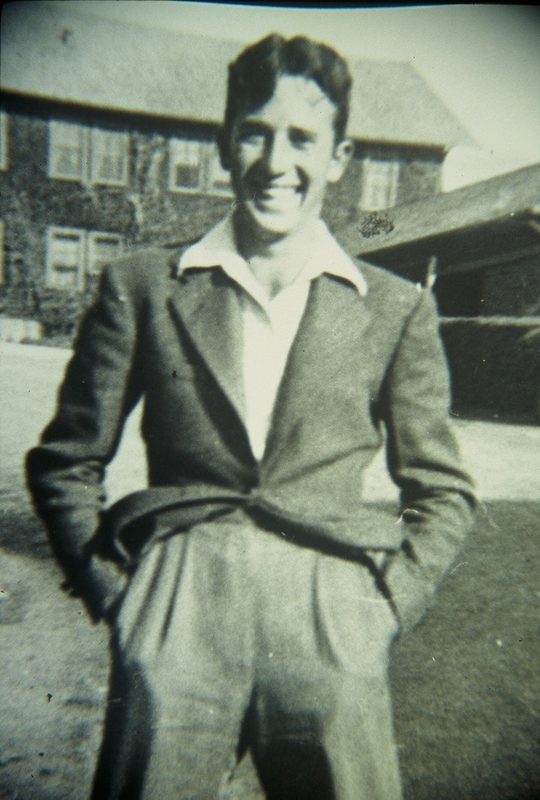 Thank you so much for making the messages of Bro Carl Ballestero available to listen to. Such great messages.. I decided to start at the beginning and listen to all of them. Hello. My name is Becky Cantu. My late mother’s name was Annie Brown. She talked often of living in the same “house” with the Ballesteros. She said that shared the same kitchen. She was Annie Lunsford at that time. Can you please tell me, if you know, where your great father got the Holy Ghost? I am trying to gather history, especially at 9th & Lowe Gospel Tabernacle. My email address is bexter77@gmail.com. Thank you and God bless you! My father received the Holy Ghost in an Assembly Of God church in Fresno CA. The Rev. Charles Price was the pastor.